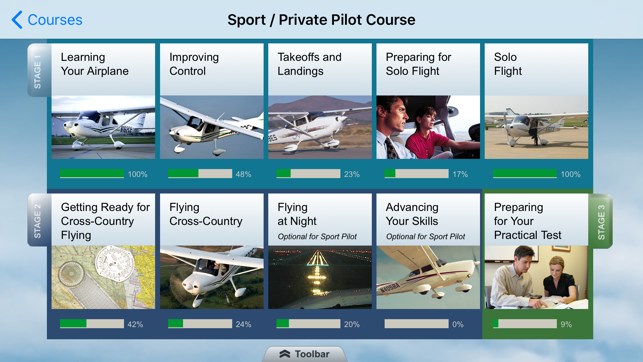 The Cessna Flight Training Companion App enables you to download and complete the lessons from your online Cessna Sport/Private Pilot or Instrument Rating courses -- anywhere, anytime! 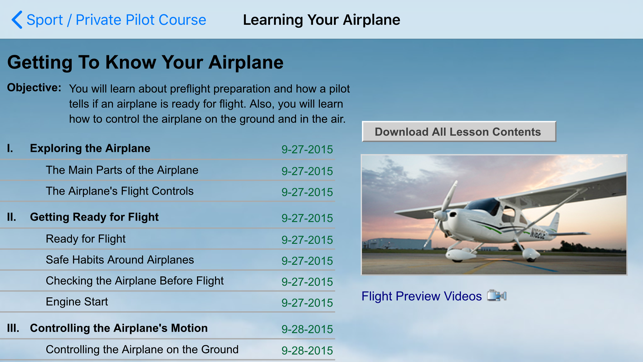 To use this app, you must have already purchased and enrolled in a Cessna online course. 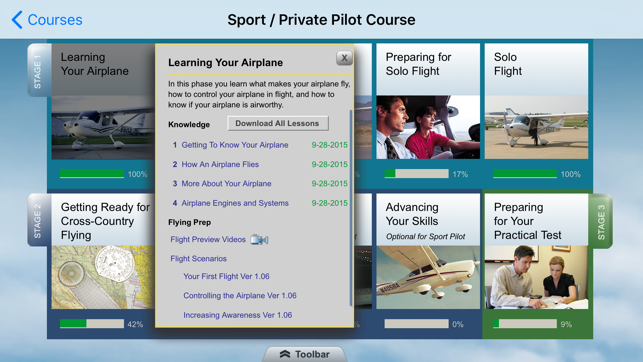 The Companion then allows you to download and complete labs from your Cessna course by studying the lesson content and taking the quizzes that follow each lesson right on your iPad--and your progress is automatically synced with your online course. 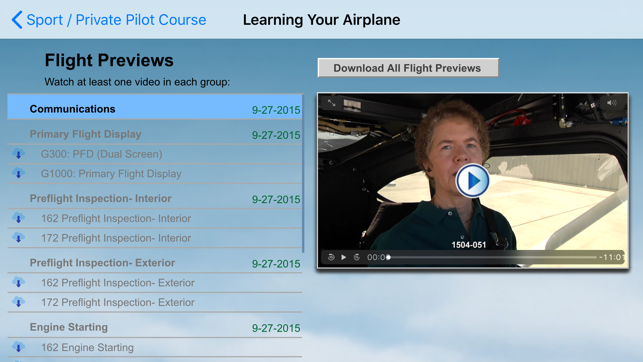 You can also download and view each of your Video Flight Previews offline, so that you will be fully prepared for each flight lesson. The Cessna Training System is specifically designed to work best when studying at a Cessna Pilot Center and will efficiently give you the vital flying knowledge you'll use for the rest of your flying career. These innovative courses, developed in partnership with Cessna, are complete online training courses that integrate ground and flight training to take you from zero time to your new certificate or rating. Since the ground and flight lessons are paired, these courses work best if your flight instructor uses the Cessna Flight Training Syllabus, as is done at Cessna Pilot Centers and select flight schools around the world. You'll learn faster, retain more, stay ahead of your training, and achieve your goal quicker than through more traditional approaches. 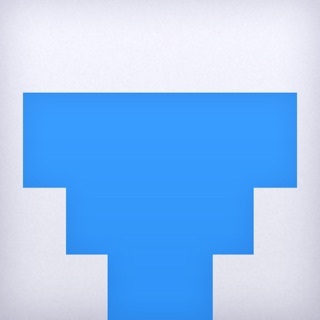 • Now available on iPhone in addition to iPad. 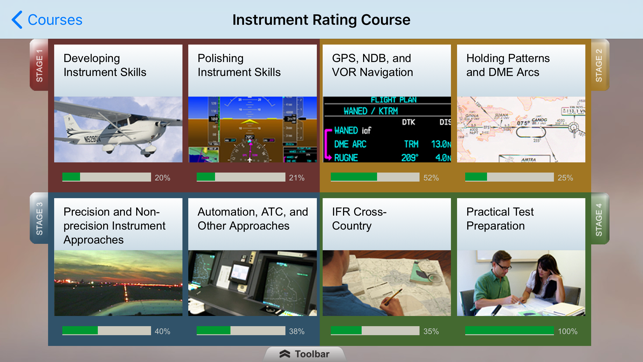 • Toolbar on course screens for Feedback, FAA Test Prep, Cessna News, Course Progress, and more. Downloaded this app to be able to do my coursework anywhere, however upon opening the app, it will not let me do anything with it. It will not let me click on my course. 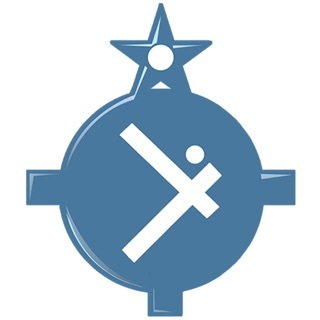 This app does not sync your progress with the server reliably so that you’ll need to repeat whatever sections are not synced. Kings tech support does not respond to support requests, very disappointing experience. © 2018 King Schools, Inc.